UPDATE – the U14 girls matches have been called off due to the weather. Our Seniors take on Bredagh in the Dub, Belfast (Queens playing fields) at 15:00. To finish up we have a night with 3 Down managers (Jim McCorry, Pete McGrath & James McCartan) in St Bronagh’s Social Club with Stephen Poacher hosting! Tickets available on the door. Not for getting tomorrow also, “Coffee with a Cause”. 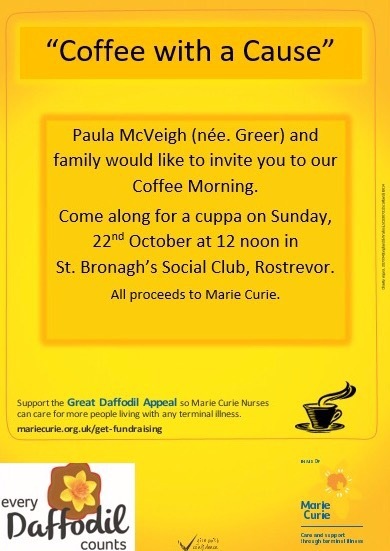 Sunday from 12 in the Social Club in aid of Marie Curie! We hope to see you throughout the weekend!